For the past few years, I've lived and sailed on an old 27' GRP boat full-time, covering thousands of miles offshore. For a variety of reasons, though, I will have to sell this boat soon, and return to land. I am now dreaming of a future journey that would begin by building a pocket cruiser, something in the 20-24' range, and taking it across the Pacific. Though I have plenty of sailing and liveaboard experience, along with all the maintenance that comes with that, I have no boat-building experience and am looking for some advice. I welcome the challenge and commitment of such a project, and that, once completed, I will know the boat intimately, every facet, nook and cranny. That has been a problem for me on my current boat -- too many surprises, and the struggle of learning how to fix them on the fly, far from resources, without the right experience. I'd like to build a medium-to-heavy displacement full or long-keel boat for safety and stability. Aesthetically, I'm a big fan of two-mast configurations, but on such a small boat that might be impractical. I also like double-enders for their looks, but am very aware of their practical limitations and the difficult of mounting stern hardware like a windvane. I think I'd like a design I could strip plank and glass-over, but correct me if I'm wrong on that front. I would also build a tender using the same technique, first, before even thinking of tackling the actual project. Any advice, or plan suggestions are much-welcomed. I can't offer any specific recommendations re vessels, but if you haven't yet, be sure to read John Guzzwell's tale of 4 years of mostly solo ocean cruising in his home-built 20 ft Trekka. His voyages were all undertaken back in the 1950s, he writes in a very unassuming way, and his little vessel is now being restored at the Victoria Maritime Museum in British Columbia. The Museum web site has a short video featuring Guzzwell. If I were building a small boat to cross the pacific, I would build it carvel because it is so much more enjoyable for me. Most people would strip build as you suggest. I would have a long straight keel in two pieces with the apex line of the rabbet right along the seam, so the rabbet can be cut easily before the timbers are assembled. My frames would be steam bent, as it is the fastest way to frame, though it does require access to good oak. I would look hard at a raised flush deck, both to increase your small cabin, and to provide reserve buoyancy for a boat that will feel so small compared to the big waves of a gale. My first effort would be to fit a junk rig, probably on a single mast, for the simplicity and make-it-yourselfity. I too love split rigs, maybe some sketching would reveal a gaff yawl configuration that works. The little mizzen would provide a "parking brake" keeping the head to wind while reefing or changing the other sails and when backing down on the anchor, it would give a handy place to lean, serve to balance the helm to allow sheet-to-tiller self steering, and could fly a mizzen staysail in combination with a big genoa to keep the dangerous boomed sails furled when the trades are blowing. My boat would not be overly deep, wetted surface is a killer in light winds on a small boat. I might even fit a small centerboard with a medium draft fixed keel. At least medium draft (3-4') will be needed for any chance of room in the cabin. In bad weather the CB would be up to allow some give on the face of waves. Lead ballast, all outside, I'm not a proponent of very light boats. Some boats that fit some or the other of the above ideas are Gilmer's Blue Moon, Benford's Badger, Crocker's Stone Horse, Fenwick William's Annie. Pics in that order. Wow! I'm familiar with and like the other three a lot, but that Annie is breathtaking! There is a Sundowner build on the forum. Good luck and please keep us informed as you make your journey into boatbuilding. I agree, Annie is a stunner. In the double-ender realm, Gartside's Hannah II is a capable little ship. In fact, I would puruse Gartside's online catalog, he has a good variety of well designed craft in every size ranging from deep and heavy to light and delicate. The Atkins have quite a few boats in this range. Little Dipper is in the deep and narrow camp, but looks ocean worthy to me. At the larger end of your range, the Eric Jr is a lovely boat. Last edited by J.Madison; 03-28-2019 at 01:41 PM. Apart from the usual advice that buying a used GRP boat will be far cheaper than building a new one in wood... The key bit in the OPs list, is that he has no boatbuilding experience. Learning on the job with carvel will be a big and long curve. Badger was mentioned, but big at 34ft. Benford has smaller dory based designs in a similar vein. Quite a nice one at 30 ft. It is still bigger than the OPs ideas, but would go together reletively quickly compared to classic plank on frame. Much also depends on if you have a forest out back, or have to buy milled planks. I suspect the latter, if the OP has been at sea for a while. Actually a lot of boats capable in the right hands, including the Amigo. How much displacement can you afford? Im getting on a bit to enjoy surfing out in the open ocean, but there was a time it was fun, you can get a lot of fun and performance from ultra-light displacement boats, and having the ability to "run" is nice to know, even if 90% of the time the boat is powered down in displacement mode. Search out "black soo", if you do not need ultimate comfort and carrying capacity, a boat like this makes a lot of sense, to some people. Its important you start a boat you know,or at least believe you can finish. 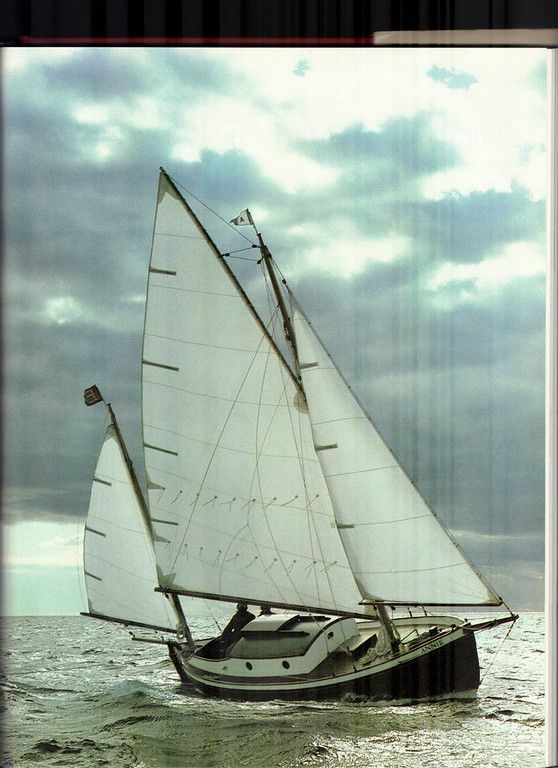 Bruce has a great thread on his 34' Venus Ketch. There is a 28 ft version also mentioned in there somewhere. A bit bigger than you are enquiring, but jeez... lovely boat to do what you want. I would have bought up the Venus 28, as it was for a very long time my idea of the perfect offshore boat for a single hander, it is however almost 10 tons of boat! Not what i call a pocket cruiser. The Hagar was a stretched 24ft, so no reason you could not reduce the frame spacings to reduce the size from 28 to 24ft. Keep dreaming as in that length of boat for that journey you will be building a suffering nightmare. As a precursor lock yourself in your wardrobe for a week and hose entire self until sodden daily. Strip planking does not need glassing. Strip planking the dingy would be a mistake. (Maybe strip building). Chances are you would need a 4mm nesting SnG dink. So pragmatic lol. As they say; there's the plan and then there's what actually happens. Its not to say it cant be done, it just needs a different mindset to the majority. I confess i would probably not choose to go cruising again without an engine, but i CHOSE not to afford it, it would have meant another 12 months hard labour. I only had hand tools, enough for general and emergency repair, enough paint to re-coat the entire boat once, spare sails, 4 anchors, spare chain and warps. I never felt i was missing out on anything while at sea, only when rafting up alongside some Swedish bloke who looked like he purchased the contents of an entire chandlery shop......but we were both in the same place. Have the essentials really changed from a good sound and clean bottom, good sails, ground tackle and a china tea-pot? The original small ocean cruiser. ^ Trekka was the first boat that put my thoughts about light displacement and offshore into gear. Trade offs at both end of the scale. We need the OP to come back with more of his thoughts regarding his ideas and intentions. Grey Seal or Ron Mhor? Some of these suggested boats are really fantastic and are opening my eyes to a world of plans I didn't know existed. Annie is beautiful and seems to be an almost perfect candidate. The Gartside catalog is also impressive -- at least for someone like me who has only been exposed to the plans that can be perused on this website. If anyone else has good sources where plans can be browsed, I'm happy to visit. As for space limitations and cluttering up the mess, I think I'm well prepared for that already. The boat I am on is fairly average in terms of interior space and storage for a 27', and I don't have standing headroom at 6'. 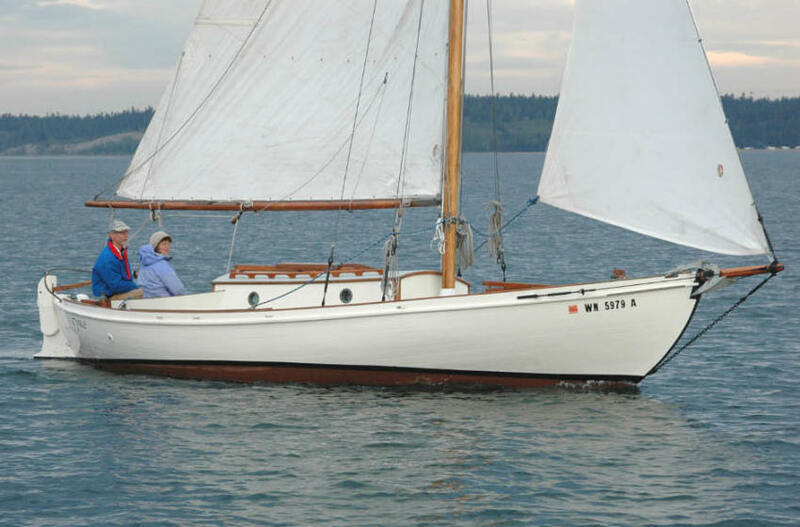 Boats like the Dana 24 and the Flicka 20 were what originally turned me on to the capabilities of small craft. 27' may be substantially bigger than 24', but then again, I've seen 24' boats that felt bigger than my boat. In any case, I'm not too concerned about finding space for solar panels, batteries, and other cruising gear, and I'm accustomed to a life without the luxuries that most of us take for granted, but it is one of the reasons why I prefer a medium-to-heavy displacement boat. I think the reason I said I preferred strip-planking could be a result of my lack of knowledge on the subject. I trust and know epoxy, but not as much wood, and a glass and epoxied boat over a wood structure seems like the best of both worlds in my mind. I too was looking for a tiny long range cruiser, and found an answer in William Atkin's 'Perigee' design. I saw her in the water for the first time last week (picture attached) and was delighted with initial sea trials (I cruised local waters for a week). The 1934 design was meant for carvel, but mine is epoxy strip planked and glassed inside and out for the purpose of creating a really strong boat. It is too early to make a recommendation of my particular choice, but if you haven't already, it is worth checking out designs on the Atkin web site. Lack of building experience would not stop you from building as skills can be learnt as you go. However, a lack of building experience would likely lead to an underestimation of just how big a job it is to build even a small boat. If the dream is to build as well as sail then go ahead and build what you want using whatever method you want, and be ready to not have a life other than boat building... but if the main objective is to go sailing and building is just a necessary evil, stick with buying an existing boat. I just looked up used Flicka 20....... They ain't cheap. Saw one that had filled with rainwater under a tree. Needed a full gut job on the interior. Who knows what damage her supporting structure may have caused with all that weight.... 10 grand. For a 20 foot boat that needed to essentially be completely rebuilt. Hull and rig were sound though. Aluminum mast. I was figuring maybe 5-10k for one in reasonable condition. The good ones were up over 20 and even 30 grand. Don't bother with reeks and wrecks. There are plenty of good quality boats going cheaply. Gotta agree with Navydog. There are too many really worthy boats out there that just need some love and use. There was an Eric Jr completed hull up on Vancouver Island a while back that I think went for the cost of materials. Eric Jr, now that's a nice design. I cast my eye over her lines a few times back when I was still trying to decide on the right design for my build. I'd put her right up there with folkboats and vertues. I've done the whole, "go small, go now" thing. I didn't even know how to sail when I bought my current boat, and was baptized quickly in salty offshore passages. I'm glad I did it that way. I got to sail some of the most beautiful stretches of ocean and islands on the planet, for a very good price. In my opinion, too many people who want to live the cruising dream spend far too much time finding the perfect boat, or making their project boat "perfect", that they loose sight of their dream, or, when they finally get out there, discover it's not what they thought it would be. At this point though, I'm more interested in the process, the skills I'd acquire along the way, and coming out the other end with something that I can look at say "I built that". And, if at that point I still am in such a fortunate position in my life where I can untie the lines, and set off across an ocean, I'll have the perfect craft to do so. If not, that's OK too, as I think I'll derive satisfaction from the process. Of course, maybe it'll be frustrating and miserable and it won't be cathartic at all. Most of the work I've done on my current boat has been miserable, difficult and expensive. But a big part of that has to do with the inconveniences of living on it at the boat you're working on, suffering in hot sweaty boat yards (in the tropics) and dealing with finding parts and tools on remote islands and faraway places. And so I think one of the things I would look forward to most is the fact that, even on the frustrating days of the build process, I'll always be able to shut the door to the shed and walk away to deal with it another day -- which is a luxury I've never had on my boat. Anyway, I've been doing my homework, and and slowly convincing myself that cold-molded construction is probably the way to go. I thought before that strip-planking would be better, but that was mostly an argument from an ease-of-construction point of view, and I hadn't considered that it be a less-stable method for a boat of this size. 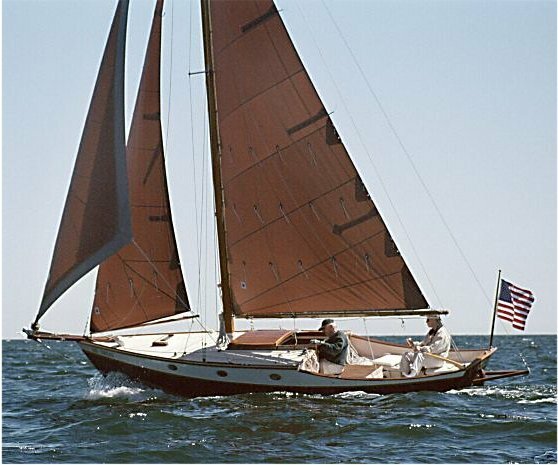 I really like Gartside's Hannah II 24' Cutter, though I'd probably consider adding extra water tanks for endurance if I were to build it -- perhaps epoxy/wood conformal tanks below the floors or elsewhere. I think at the very least I'll take some sort of boat-building course, and get some general woodworking experience. Though I do believe most can learn almost anything on their own, it's always much more efficient to get it straight from an experienced person. If you're doing it for the enjoyment of building, cold molded is not very enjoyable. It makes a good boat, but it is a slog to get through. Here is what I would do, build a glued lap dinghy now. That is your introduction. It will teach you to loft, line out, spile, and persevere. When complete it will serve as a weekend diversion and eventually as tender to the bigger boat. Then i would build the mother ship carvel. Hannah II can probably be built faster carvel than cold molded, though it does take more skill and better materials. You don't say where you will wash ashore, and that will have a lot to do with what materials are available. If you were building just to go sailing, I would say strip build or buy a used boat. If you were going to use a crew of semi-skilled helpers I would say cold molded. Working alone for the enjoyment of it, carvel planking all the way. I think the reason I'm leaning toward cold-molded or strip-planking is a consequence of what I've been exposed to in the research I did before I bought my current boat, and from experiences along my journey. In Grenada, I met a man on a medium-sized wooden ketch. I'm not sure how old it was, but it was sunk and grounded up against the mangroves, and the man was trying to sell what he could salvage. He had left for one week, and in that one week it was unusually cloudy, his batteries drained, and his bilge pumps stopped. With the cold-molded and strip-planking methods, it seems normal to cover the outer hull with a layer of cloth and epoxy, thus negating any issues of leaking below the waterline, but from what I've gathered, methods like carvel planking rely on caulking for their water tightness. To me, that sounds like more maintenance, and (because it's alien to me), I don't trust it like I do epoxy. Meanwhile lapstrake seeps wholly dependent on the precision of my work for water-tightness, and I'm not sure how that makes me feel. Again though, a lot of these opinions are probably a result of my ignorance more than anything else. Luckily, I have quite a bit of time before such a project will begin. I still need to sell this boat, move back to the states, go get one of those pesky "jobs", and settle back into land-based existence again. A new carvel boat will be dry if built with reasonalbe care. My boat is 60 years old and the bilge pumps have not come on once this winter. In the summer when sailing hard I do weep a little bit of water through the dry topside seams when I heel. If you need a layer of plastic to feel good about your boat, you aren't alone. Cold molded boats are good boats. Some people don't seem to mind the never ending sanding and fairing, the space suits and respirators, temperature controlled build, mountains of consumable waste, and sticky spots in their hair. For most cold molded boats, you have to fully coat and fair the hull 3 separate times! That is a job that is miserable just once. I'm just being a bit of a crotchety old snob, but somebody has to stick up for wooden boats! The truth is that the reputation for leaky old buckets is hardly fair, as people tend to be comparing boats that have lived hard for 6 or 8 decades with relatively new fiberglass boats. Of course the old wooden ones leak, they were probably built for a 30 year life! A new traditionally built wooden boat has no more maintenance requirements than a cold molded one until you get enough decades down the line that recaulking or replacing planks starts to come into play. Carvel boats often are a lot of work to maintain, but that is because we use way too much varnish, which isn't the fault of the planking method. Don't be put off by "Trekka"s" apparent small size, I met John Guzzwell when he lived in N.Z. He was a well built young fella and stood about 6'plus in his bare feet, but he had his life style down to a fine art. Small B.R. did you design your own gaff rig or adapt from another Atkin design??? your little dreamship is looking pretty good on the water. It's hard to credit she is only 17ft. l.o.a.